John Smith Thach was born in Pine Bluffs, Arkansas, on April 19, 1905. In 1923 he was appointed to the U. S. Naval Academy, where, on June 20, 1927, he was graduated and commissioned an Ensign in the U. S. Navy. Admiral Thach was assigned to the battleships USS MISSISSIPPI and USS CALIFORNIA, until he was ordered to flight training at Pensacola, Florida in 1929. In January 1930, Admiral Thach was designated a Naval Aviator and was assigned to his first operational squadron. From the beginning, Admiral Thach proved himself a highly capable pilot, becoming recognized as one of the Navy's aerial gunnery experts, repeatedly shooting top scores in every type of combat aircraft he flew. During the next few years of his career, Admiral Thach's superior performance qualified him to be a test pilot and flight instructor and to receive a letter of commendation in 1940 for "exceptional skill and technique in aerial gunnery and bombing; efficient and meticulous operation of a squadron gunnery department; marked ability to train other pilots in fighting plane tactics and gunnery." When the United States entered World War II, Admiral Thach was a Lieutenant Commander commanding Fighter Squadron Three, embarked on the aircraft carrier USS SARATOGA. At the time, Admiral Thach was one of the top fighter tacticians in the Navy. Intelligence reports from the Sino-Japanese was convinced him that the Navy's top carrier fighter, the F4F Grumman Wildcat, was no match for the superior flying performance of the Japanese Zero. Admiral Thach sought to devise a means to give his squadron a fighting chance against the Zero. The result, which he worked out with match sticks on his kitchen table, was the famous "Thach Weave" still used today by modern jets fighters. He initiated the practice of having U. S. fighter planes operate in pairs, instead of trios. The pair would weave back and forth as they encountered the Zero, thus providing the wingman the opportunity to shoot at the Zero on his partners tail and vice versa. This tactic proved highly successful at the Battle of Midway. Admiral Thach returned to Pearl Harbor to instruct other pilots in the use of his new technique. Later in the war, Admiral Thach was assigned to the Fast Carrier Task Force as Air Operations Officer, where he developed the system of blanketing enemy airfields with a continuous patrol of carrier-based fighters. The tactics is credited with destroying the air offensive capabilities of Japan. His direction of the Navy's final offensive blows to the Japanese mainland led to an invitation to participate in the Japanese surrender aboard the battleship USS MISSOURI. Admiral Thach continued his distinguished career after the war, commanding the aircraft carrier USS SICILY in the Korean conflict, and later, the carrier USS FRANKLIN D. ROOSEVELT. He was promoted to the rank of Rear Admiral in November of 1955, Vice Admiral in January of 1960, and to Admiral in March of 1960. In recognition of his work, the Navy annually awards the best anti-submarine warfare aircraft squadron "The Admiral Thach Award". In 1965, Admiral Thach was ordered to duty as Commander-in-Chief of U. S. Naval Forces in Europe and served there until his retirement in May 1967, after more than 40 years of service. Admiral Thach died on 15 April 1981. Admiral Thach participated in twelve major engagements or campaigns and was awarded the following distinctions: Distinguished Service Medal, Navy Cross, Letter of Commendation from Fleet Admiral Nimitz, Gold Star in lieu of second Navy Cross, Silver Star Medal, Legion of Merit, Bronze Star Medal, Gold Star in lieu of second Legion of Merit, plus other campaign, unit and service awards. Admiral Thach is survived by his two sons, John Smith Thach, Jr. and William Leleand Thach. 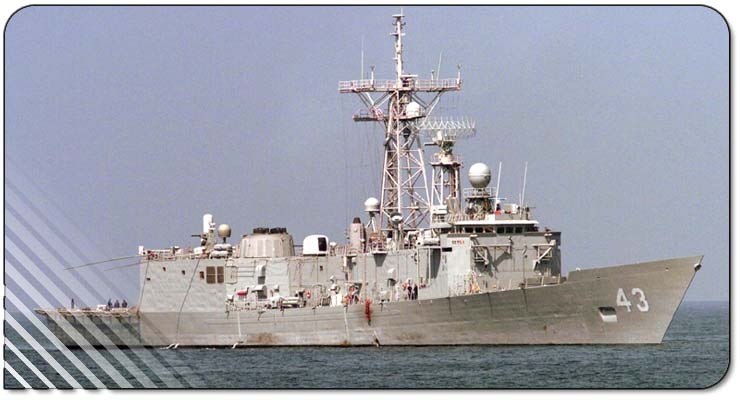 USS THACH (FFG-43), homeported in San Diego, California, is the 37th ship of the Oliver Hazard Perry class of guided missile frigates. It is typically assigned to Destroyer Squadron SEVEN located in San Diego. THACH's mission is to provide anti-air, anti-surface, and anti-submarine protection for carrier strike groups, expeditionary strike groups and other military and merchant shipping. The ship is also capable of operating independently in support of counter-narcotic operations, maritime interdictions against afloat terrorist assets, and other special mission profiles on the high seas. Utilizing its organic Visit, Board, Search, and Seizure team and SH-60B Seahawk helicopter detachment with forward-looking infrared radar, the ship has the capacity to locate, track, and intercept targets far over the horizon. The new direction for the naval service remains focused on our ability to project power from the sea in the critical littoral regions for the world. Success in the asymmetric warfare environment of the 21 st century requires thorough evaluation, rapid decision-making and almost instantaneous response to any postulated threat. The systems aboard THACH have been designed to meet these demanding and dynamic prerequisites, and to do so with minimum human interface. The ship’s weapons include a 76mm rapid-fire gun, Close-in Weapons System (CIWS), and anti-submarine torpedoes. The LAMPS MK III video data link system brings state-of-the-art computer technology to the warfare arena, as well as integrating sensors and weapons to provide a total offensive and defensive weapons system. In addition, computers control and monitor the gas turbine engines (the same engines installed on DC-10 aircraft) and electrical generators. Digital electronic logic circuits and remotely-operated valves are monitored in Central Control Station which initiate engine start and result in a "ready to go" status in less than ten minutes. The heart of the ship, though, is the crew. High technology systems demand skilled technicians and professional leadership to be effective. The concept of "minimum manning" means, simply, that with professional Sailors, THACH can meet the challenges of modern naval warfare with approximately half the crew found on other ships comparable size and capability. 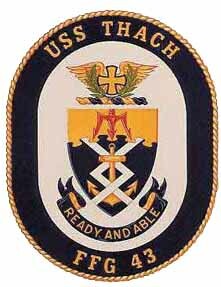 The Crest: Like all heraldic Navy insignias, THACH’s crest has special meaning. The blue and gold colors are traditionally associated with the Navy; blue for the sea and gold for excellence. The pair of wings in the upper crest refers to Admiral Thach’s contributions to naval aviation as a pilot and leader. One of the contributions to naval aviation as a pilot and leader was his invention of the "Thach Weave," symbolized by the interlaced silver chevrons. This two-plane fighter tactic, used to cover each other from enemy fighters, is still used by fighter aircraft today. The three-pronged trident is shown pointing down from the sky, symbolizing naval aviation’s role of projecting power from the sky and the sea. The three tines of the trident also represent Fight Squadron Three, the unit Admiral Thach commanded during early Pacific carrier battles in World War II. The cross within its outlined border and the wreath refer to Admiral Thach’s first and second awards of the Navy Cross and the Navy Distinguished Service Medal. The anchor in the center of the insignia focuses attention on the nautical nature of both Admiral Thach’s service to his country as well as that of our ship. Motto: The ship’s motto, “Ready and Able,” is representative of Admiral Thach’s preparation and success in battle, as well as the challenge for today’s Sailors serving on board USS THACH.